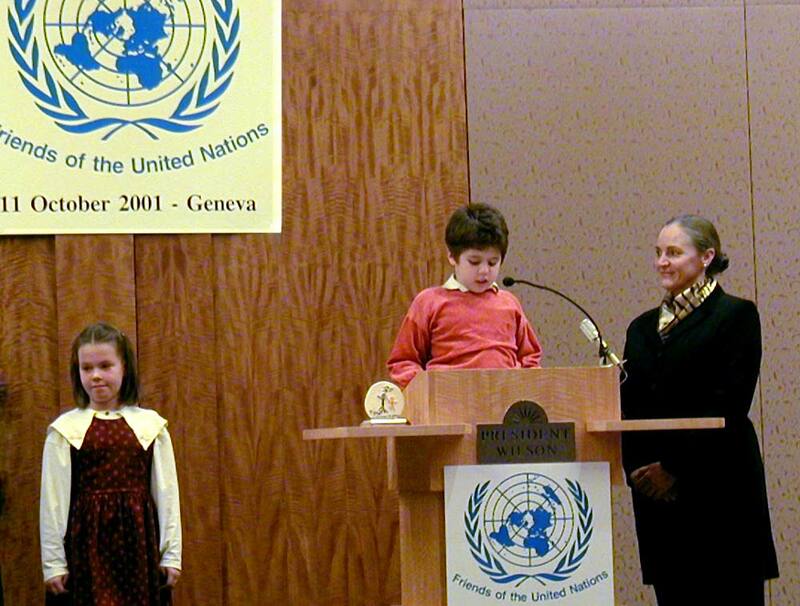 <- Winners of a European-wide Essay Contest—three young people from Hungary, Czech Republic and Austria—were honored at the United Nations in Geneva. Youth for Human Rights International (YHRI) was formed in 2001. Its first action was to launch a European-wide Essay Contest for youth between the ages of 8 and 18, in coordination with Friends of the United Nations. 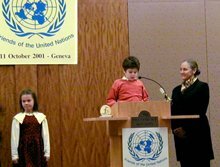 Three young people from Hungary, Czech Republic and Austria won the contest and a trip to Geneva—home of the United Nations Office of the High Commissioner for Human Rights (OHCHR)—to receive their awards on October 11, 2001. With the expansion of YHRI and its integral message that human rights should be learned at a young age, came a demand for more information from all over the world. Accordingly, in February 2004 YHRI representatives set out on a 45,000-mile World Educational Tour to increase the understanding of human rights among youth and to found new YHRI chapters. In the space of five weeks, YHRI delegates traveled to both well-populated and far-flung locations, including Tokyo, Japan; Bangkok, Thailand; Accra, Ghana; Georgetown, Guyana (South America); and Mexico City. Along the way, YHRI representatives met with senior government officials, visited local towns and villages, and distributed to both parents and children copies of What Are Human Rights? 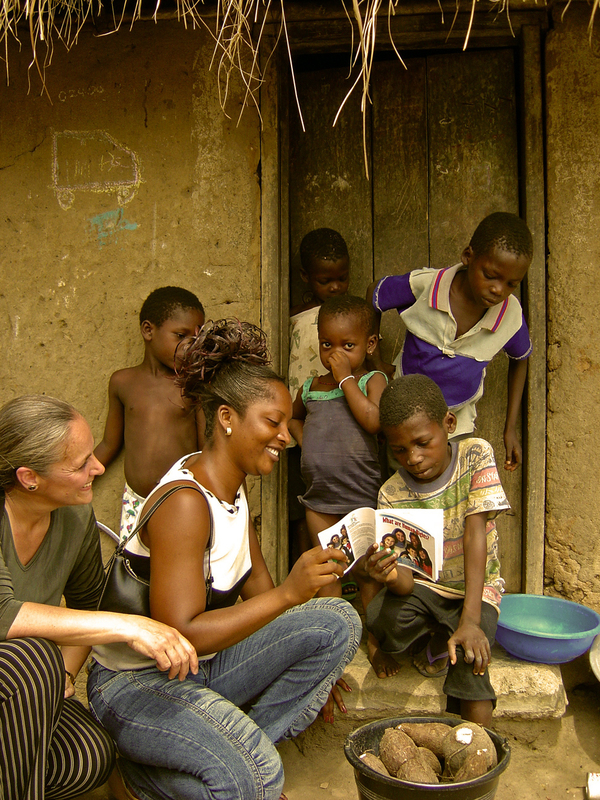 booklets and YHRI’s educational flier on AIDS. At each stop, they asked the children to write short accounts of what they understood about human rights. 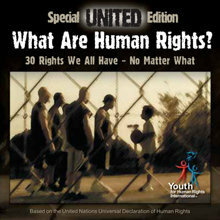 During the first World Educational Tour, director Taron Lexton, at the age of 19, filmed many of the scenes for UNITED, YHRI’s award-winning human rights music video. Two thousand volunteers, including 150 actors, donated their time to the movie project, which contains footage from 13 countries. 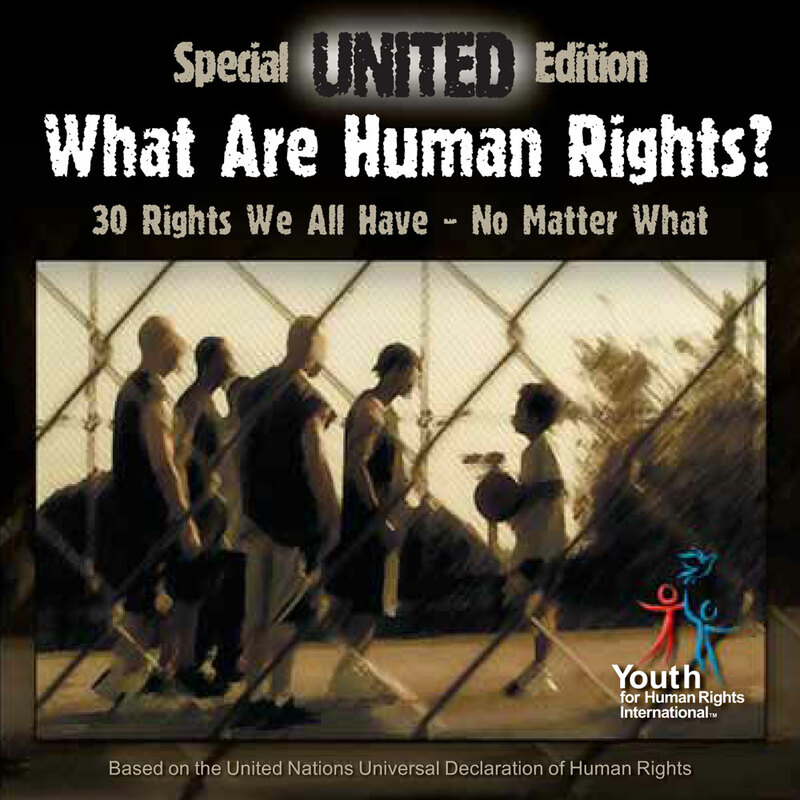 UNITED is truly a youth undertaking, as the crew comprised mostly teenagers, with young rappers adding their brilliance with a song about human rights. First shown inside the United Nations’ New York headquarters in 2004, UNITED has received many awards, including “Best Human Rights Film” at the Taglia Corto Film Festival in Florence, which is co-organized by UNESCO. Most importantly, however, the message of the film, available in 15 languages, reaches across barriers to youth of all races and ethnics. Educators and community leaders consider UNITED a unique tool for developing human rights awareness among young people.